Alyssa Eade is a client of Minutes Solutions. About a year ago she sat down with her grandmother and conducted an interview about her life story. She had the interview saved on an audio file for over a year. Just recently, Alyssa’s grandmother unfortunately passed away. She knew that she had to get the audio file of her interview transcribed before the funeral so she could share stories with family and friends. She reached out to Minutes Solutions to help her transcribe the audio file in a relatively urgent time frame. We decided to sit down with Alyssa and ask her a few questions about why she thought it was a good idea to have the interview transcribed. In our opinion, what she did was amazing, as we believe the ability to share stories with future generations about family history, lineage, and perseverance is something that many take for granted, until it may be too late. Why did you decide to interview your grandmother? Last year, when my husbands’ grandfather passed away, I read a copy of his memoir. He had written his story about a decade ago, with beautiful penmanship. My mother-in-law later transcribed it and had copies available at his Shiva [a Jewish ritual for mourning the loss of a person]. As soon as I picked it up, I was hooked. It was so interesting to learn about a man I only met in his 90’s and to read his perspective on his childhood, life milestones and memories. After reading this, I knew I needed to take the time to interview my grandmother so that she, too, could have a memoir. My grandmother, who lived to be almost 92 years old, was the “sharpest tool in the shed”, even up until her last day. I knew that it would be very difficult for her to physically write out her story, but, if I interviewed her using an audio recording device, she would have plenty to say. And that she did! Last July, my cousin and I spent the afternoon with my grandmother first by having lunch and then asking her questions about her life story. This was an experience I will always cherish. To understand a person, it’s important to understand where they came from. Even though I was very close with my grandmother and felt I knew her well, I knew there was a lot about her past that, as a grandchild, I had never asked about. 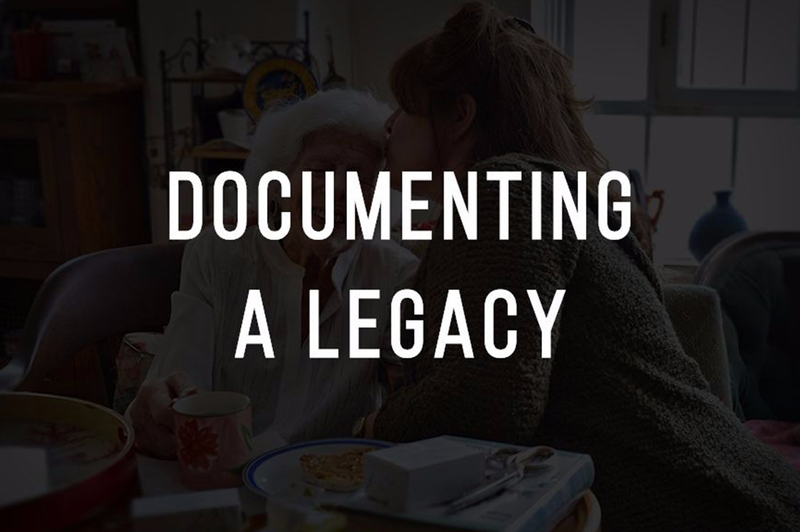 I knew that if I took the time to interview my grandmother, not only would she love to share her story but, more importantly, it would be a valuable keepsake for all of her loved ones in the future. Did you learn things you otherwise did not know about her and your family? If yes, what did you learn? Definitely. What I found most fascinating were the experiences she shared about getting married and becoming a mother – because these are the life stages that I am currently facing (being newly married and thinking about starting a family). Shortly after my grandmother got engaged to my grandfather, he took off to Germany to serve in the army for two years. To think that they could only communicate by snail mail for two years would be unimaginable today. She also shared that prior to giving birth to my Dad, she had a baby that lived for only 10 days followed by a miscarriage. Beyond these adversities, I found it fascinating to learn about her education, her views on gender roles and her religious identity, what she did for fun and about her relationship with her parents and grandparents. Why did you decide to have the audio transcribed? After my grandmother passed away, I realized I had the audio recording of the interview with my grandmother, but had not shared it with anyone. I decided to have the audio recording transcribed because I thought it would be easier for people to skim parts of the interview and also to have it as a documented piece of family history. What benefits did you find from having the audio transcribed? The transcribed interview allowed more people to learn about my grandmother in a digestible format. The audio recording is almost two hours in length, while reading through the interview takes about 15 minutes. When our rabbi was preparing the eulogy about my grandmother, I was amazed that I had the answers for so many of the questions he asked about – some that no one else knew or remembered the answers to. I was able to share the transcribed interview with friends and relatives – and many of them have told me how much they enjoyed reading it and learning about my grandmother. Would you recommend other people to do what you did? Why? Without a doubt. This interview with my grandmother is a cherished gift that I feel so fortunate I took the opportunity to do. I consider this to be the greatest keepsake I am left with from my grandmother. I know that I will read and listen to this interview at different stages of my life when I want to remember her. I hope to one day share my grandmother’s story with children of my own so that they can understand and appreciate their roots. I know I do.